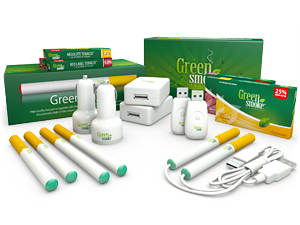 One of the world’s leading e-cigarette brands, Green Smoke offers a variety of starter kits available in various configurations. These include a selection of battery colors, flavors, and Nicotine levels. In response to queries from our readers, we will attempt to provide clarification regarding the current line of kits so that you can make the best possible selection for your needs at the best possible price for your budget. If you and your significant other are both smokers, the Love Birds Kit will make life that much sweeter — not to mention better smelling — for both of you. The Love Birds Kit contains everything you and your special someone need to lose those nasty tobacco habits and begin enjoying the pleasures of “vaping” together with Green Smoke. No more searching for misplaced batteries or chargers, this kit includes 2 of everything you need, plus 4 packs of the renowned FlavorMax™ cartomizers. Each 5-pack is available in your choice of 7 flavors and 5 Nicotine levels, so you can both enjoy your favorite cartomizers. 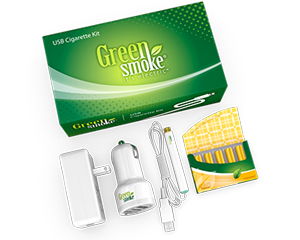 When you are finally ready to commit to a tobacco-free life, the Green Smoke Ultimate Kit is for you. This kit provides everything you need to begin your new lifestyle, while enjoying the pleasures of “vaping” with Green Smoke. The Ultimate Kit even includes a stylish carrying case available in black, white or green, and 2 5-packs of FlavorMax™ Cartomizers — each available in your choice of 7 delicious flavors and 5 satisfying Nicotine levels. The de facto gold-standard by which all other electronic cigarette starter kits are judged, the Green Smoke Pro Kit is the best-selling successor to their Basic Starter Kit. Including everything you need when you’re ready to move on from your tobacco habit, the Pro Kit also makes a great gift for the smoker in your life. What better way to let someone know you care than with a gift that has the power to forever change their lives for the better? New to the world of e-cigarettes? On a tight budget and not certain if “vaping” is for you? Or maybe you just want to pick up an extra battery, a USB cigarette, or add to your accessories. Whatever the reason and whether you’ve been “vaping” for years or a complete e-cig “newbie,” the Express Kit provides that same great Green Smoke quality, vapor and taste at price that fits almost any budget. The first kit of its kind, the Green Smoke U-Power Pack forgoes standard battery-powered e-cigarettes in favor of a completely hard-wired “vaping” experience. Whether you’re on the couch, at the computer, or sitting in you car — you can enjoy that great Green Smoke flavor and taste, without having to worry about whether or not you remembered to charge your e-cig battery. Simply plug into your nearest USB port, AC wall outlet, or your car’s cigarette lighter socket and enjoy the satisfying vapor. 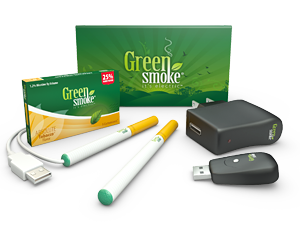 The editors at eCigs HQ certainly remember the Basic Starter Kit, as it is the first Green Smoke Kit we ever had the pleasure of reviewing. It would indeed be difficult to forget an electronic smoking experience unlike any we had encountered before. Now you can you can get the very same kit — albeit with state-of-the-art FlavorMax™ Cartomizers — at half the price we paid for it only a couple of years ago. 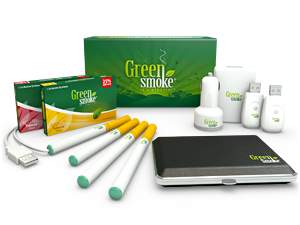 For a limited time only, and while supplies last, Green Smoke is offering their Classic Starter Kit (formerly the $129.95 Basic Starter Kit) for the ultra-low price of only $69.99. You will need to hurry as this sale simply will not last. Absolute Tobacco: The distinct flavor of natural tobacco, with a light, smooth, sweet flavor. Red Label Tobacco: The robust, bold taste of Red Label is similar to the flavor of classic cigarette tobacco. The bold Virginia taste offers a unique, enjoyable woody flavor. Tobacco Gold: A rich blend of Virginia, Oriental and Burley tobacco. A rich, sweet taste that used to only be found in the finest cigars — now available in the electronic cigarette. Indulge yourself. Menthol Ice: Menthol Ice refreshes your senses with its smooth, pleasant freshness. Its full flavor offers an exhilarating and highly enjoyable smoking experience. Mocha Mist: The taste of freshly roasted coffee with notes of chocolate. This flavor is perfect enjoyed over a blueberry muffin and a newspaper in the morning — or any other time of the day that you need a boost. Vanilla Dreams: Vanilla Dreams is made with a highly complex and enjoyable sweet, creamy vanilla flavor. The result is a gourmet vapor combined with superior flavor. An absolute treat to smoke! Smooth Chocolate: A taste of rich, dark chocolate as soon as you start vaping. It’s one of a kind “chocolate smoke” is a great way to satisfy your sweet tooth — without any of the carbs or sugar! Strong (2.4%): Compare to a strong cigarette. Full (1.8%): Compare to a full flavored cigarette. Light (1.2%): Compare to a light cigarette. Ultra Light (.6%): Compare to an ultra light cigarette. 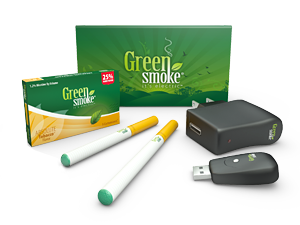 Zero (0%): Same great Green Smoke taste — with zero nicotine. Visit the Green Smoke website by clicking the link below. Enter disc10-22372 in the box marked Coupon Code in order to receive a 10% discount on your first Green Smoke purchase of $100 or more. Click for Green Smoke Interviews NYC video. 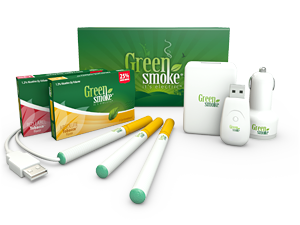 Click for Green Smoke Testimonials video Click for Green Smoke Starter Kit video. Click for Green Smoke Designer Collection video. Click for Green Smoke at the Emmy Awards video. Click for Green Smoke Promo Video.